After seeing the latest adverts on TV for 'Pino Silvestre' (I've never smelt it, or used it, so just using this as an example) I thought it might be interesting to start a discussion about affordable (I say affordable as I wanted to avoid the term 'cheap') aftershaves and fragrances. Particularly the more obscure or older ones that time may have forgotten because it now resides only in Chemist Warehouse on a bottom shelf, or through somewhere random like an overseas foreign language website. Lets set ourselves a price limit here, say $50 Australian or less? And provide a link to where it can be purchased. It is a really generous sized 250ml bottle,and although some reviews say the scent isn't long lasting, I can faintly smell it well after midday on me when I touch my face. I like it, as does Mrs Schoolforants and my daughters. I purchased mine through - https://www.drogeria-vmd.com/alpa-fougere-eau-de-cologne-panska-kolinska-voda-250-ml/ although it can be bought from other english speaking online retailers as well for a slightly higher price. Who has some other recommendations? Incidentally,they also make a brilliant balm,all natural ingredients,no nasties,and very effective. The Alpa range is as a generalisation, a screamer when it comes to bargains. Their 378 is similar to Sir Irisch Moos. The Fougere is a refined version of traditional Brut and has good staying power without being offensive or coming across as cheap. Their shave cream and balm are mediocre from my experience, so I'd recommend sticking to their after shaves and colognes. Also if buying from the above link, grab yourself the stypic pen/blocks which are good value. There's a few I like. Pashana Original. Great skin feel and long lasting scent. I buy mine here - https://www.ebay.com.au/itm/PASHANA...716607?hash=item3d6bed43ff:g:1L8AAOSwHptY93T6. Masters Lilac Vegetal. Decent skin feel and nice long lasting scent. $17.00 plus postage from The Stray Whisker. 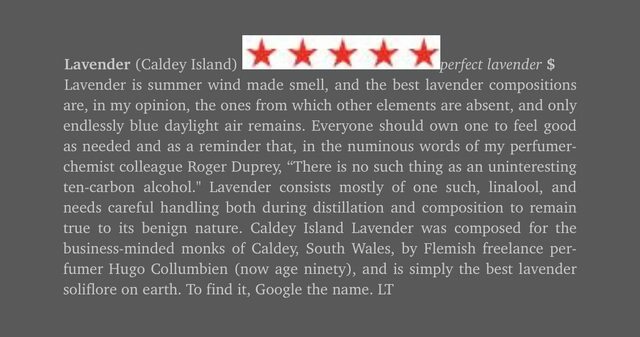 Caldey Island Lavender EdT 100ml is approx $45. Gets a 5 star rating from Luca Turin in the perfumes A-Z guide and is described by him as the best lavender soliflore on earth, it features in his list of best quiet and bang for buck fragrances. I believe it was also the inspiration for Barrister and Mann’s lavender reserve. I think Will drops the reserve lavender edt next month, I can’t compare the two but the original is cheap enough to not need to seek an alternative. Alvarez Gomez, a Spanish Pharmacy, makes a nice citrus-floral "Agua de colonia concentrada" (EdC). It has been doing it for 100 years. I have some old flashbacks of it as quite nice, and it is high ranked also the shaving cream they made, both for scent and performance. It is not so often seen out of Spain (I reckon Maggards has the shaving cream), but it is something I will buy once I'll travel to Spain to visit family.